Readers at CBSNews.com were asked to nominate their heroes for Veterans Day. If you know a hero, whether for conduct during a war or after, submit the detailshere. Hazel Ying Lee received her pilot's license the very year she took her first flight. She was that passionate about flying. A little more than a decade later, she died doing what she loved. The first Chinese-American woman to fly for the military, she was killed as she ferried a fighter plane from New York to Montana during World War II. Lee was born in Portland, Oregon, in 1912, at a time of few opportunities for Chinese-American women. After she graduated from high school she became an elevator operator at a downtown department store, one of the only jobs available to her, according to her family. But she also joined the Chinese Flying Club of Portland and at a time when less than one percent of pilots in the United States were women, she began lessons. "It was the thought of doing something she loved," her sister, Frances Tong, said in "A Brief Flight," a documentary about Lee's life. "(She) enjoyed the danger and doing something that was new to Chinese girls." By 1933, her pilot's license in hand, Lee was in China, trying to join the Chinese Air Force and the fight against Japan. Despite the need for pilots, she was rebuffed, and living in Canton, flew instead for a private airline. She would continue to be thwarted even when Japan invaded four years later. She escaped to Hong Kong, returned to the United States and finally became a pilot for the military after the Japanese attack on Pearl Harbor, and the creation of the Women Airforce Service Pilots. With too few pilots available, the women were recruited to take delivery of aircraft from the factories where they manufactured. The women flew the planes to training bases, to docks to be shipped abroad or to other transit spots. Lee was accepted in the fourth class, and was soon training at Avenger Field in Sweetwater, Texas, according to an account about her from Air Force records and Alan H. Rosenberg, the documentary's director and executive producer. And that's when she promptly made WASP history. "During training, Lee was forced to make an emergency landing in a farmer's field after her aircraft developed engine problems," according to the Air Force account. "The farmer mistook her for a Japanese pilot and held her at 'pitchfork point,' believing he was being invaded." 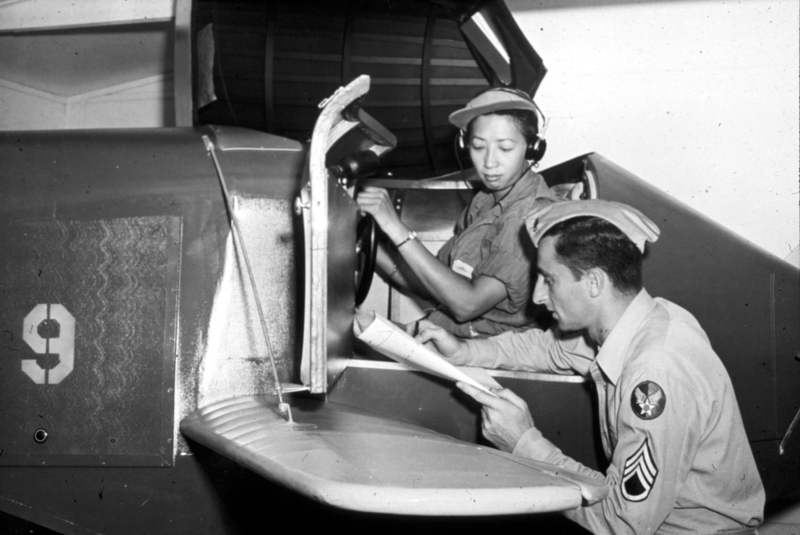 Lee was assigned to a ferrying squadron at the Romulus Army Air Base in Michigan, and soon had enough advanced training to fly fighter airplanes. She was one of about 130 women able to fly the pursuit airplanes, including the faster, more powerful P-47, P-51 and the P-63 Kingcobra. In a letter to her sister, Lee said she worked seven days a week with little time off. "She was older than most of us, and she knew what to do about a lot of things," said a former fellow pilot, A.J. Starr, who was a friend. "Mainly in every town we went to she would know where the Chinese restaurant was." Lee would often plan the menu and take over the cooking herself, her family said. Starr told the Associated Press that Lee was always jolly, and would come bouncing into her room, laughing, full of the latest information. Sarah Byrn Rickman, who has written about the pilots, said, "For women to be flying a nearly 400-mile-per-hour aircraft clear across country, not daily, but almost daily, was mind-boggling, when you consider that most women, in fact most men -- we're talking about the 40s -- had never been out of their home state, maybe even out of their home county." The pilots came from every walk of life, she said, from secretaries, schoolteachers and dancers to professional pilots. "They saw airplanes fly over and this was back when they flew low and it was romantic," she said. "The flyboys were so glamorous. It was a whole culture. And the young gals, a lot of them really liked this. And they wanted to fly, and they wanted to fly badly." The work could be dangerous; if, for example, they discovered defects as they flew the airplanes directly from assembly lines. Of the 1,102 women who took part in the program, 38 died. Lee was the last. In November 1944, Lee was delivering a P-63 from the Bell Aircraft factory at Niagara Falls, N.Y., to Great Falls, Mont. She was cleared to land just after 2 p.m., as a large number of P-63s approached at once, and in the confusion, her plane and another P-63 collided. She was pulled from a burning airplane, her flight jacket smoldering, and two days later, on Nov. 25, died from her injuries. Soon afterward, her family learned that her brother, Victor, had been killed in combat in France, where he was serving with the U.S. Tank Corps. But when the family prepared to bury them alongside each other in a Portland, Oregon, cemetery, they were told that Asians were not permitted in the white section. The cemetery relented only after a fight. Though they flew under military command, the women were classified as civilians and received no military benefits. Another former pilot, Jean Harman, remembers the women taking up donations when one of their roommates was killed. "They didn't even pay for our funerals," she said. "We had to pass the hat to ship her body home." "It was a passion," she said. "And to be able to do it for a patriotic reason was just icing on the cake." The women finally received military status more than 30 years later, when the House and Senate voted to make them eligible for veterans benefits.